It only took me 22 years to finish restoring this racing icon. The body was the last and most difficult part to complete. Trimming and painting bodies is not one of my favorite things to do. I am too much of a perfectionist and always screw up my bodies. This one is no exception. Wow that looks amazing, will get one some day. No matter how hard I look I cant find any screw ups on that body so you must be too perfectionist!! Oh, did I mention that I'm a terrible photographer as well? That would explain why you cannot see the flaws. Seriously, though, thank you for your kind words. I am quite happy it is finally done. 1. 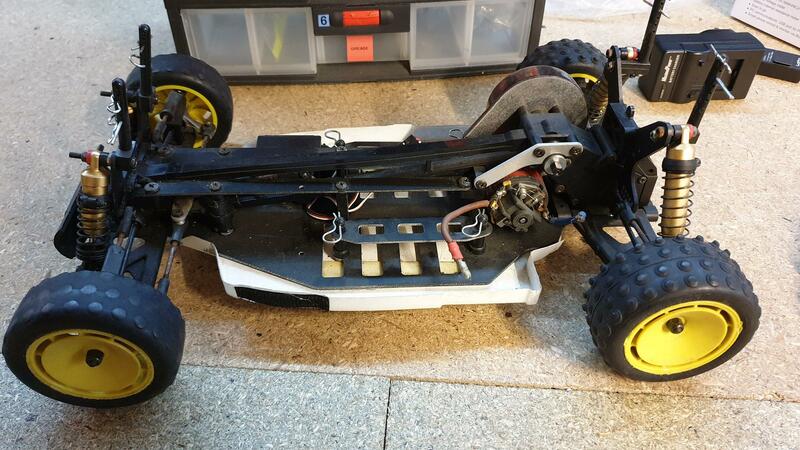 The slotted cut-outs in the rear part of the body for the rear shock tower clearance are not the same size. The pictures above don't show a top-down view that would make this visible. 2. There are 2 spots where blue paint got under the masking tape. 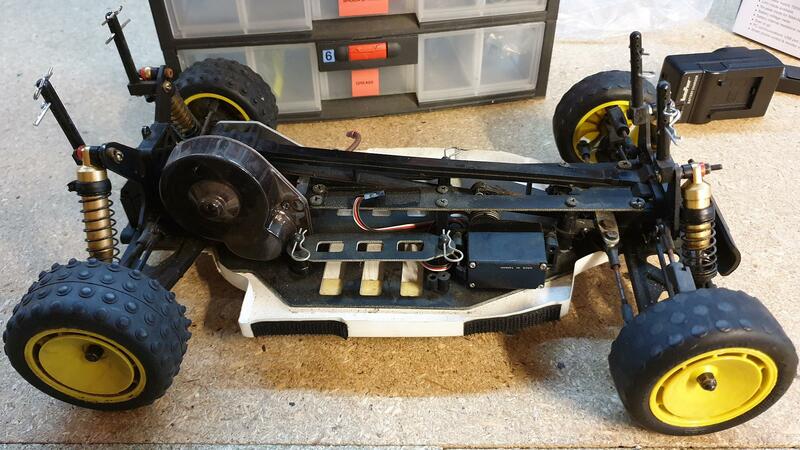 One spot is on the front left of the body where the cut-out for the front shock tower is located. It is partially hidden by the front shock tower. The second spot is on the top of the body behind the "air scoop" where the blue and white meet at the yellow line. The yellow border trim tape hides some of this mistake making it harder to spot. If you look closely at the top of the body behind the air scoop in the 3rd pic above you can see a black area in the white paint where the yellow tape border is located. It looks like a shadow. 3. I could not get the blue paint to go into the side panels of the wing. Due to this, the color is rather translucent (see-through) in those areas (left and right sides of wing cavities). 4. The white border with the clear cockpit window is not as smooth as I would like. I could perhaps mitigate this with a black marker border line on the outside of the body. In the grand scheme of things these are fairly minor problems. Yeah I know what you mean, some of those vintage Kyoshos are a real challenge to paint. Ive never done a Lazer ZX but it is on my wish list. But I do have a Turbo Optima which was very challenging to paint boxart, wasnt happy with my first body so I bought a second one which I am very pleased with. The faults you describe are very minor and dont show at all on your pics. Wow, amazing. 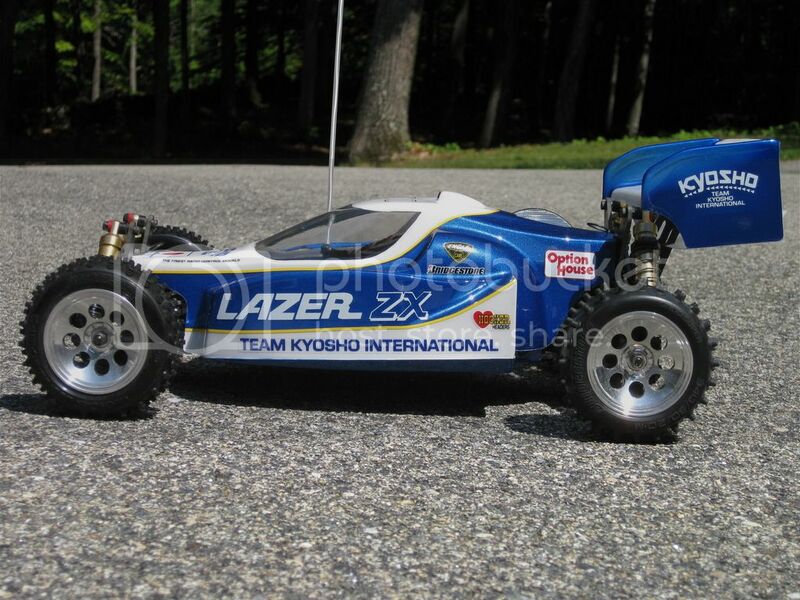 I still have my Lazer ZX but I need a new shell, where did you find one? or were you just lucky. Looks amazing BTW! I still remember how fiddly the "Finest radio control models..." transfer was to place (tiny) and also had the same problem with the translucent wing edges. Hi mrbroons and welcome to TamiyaClub! 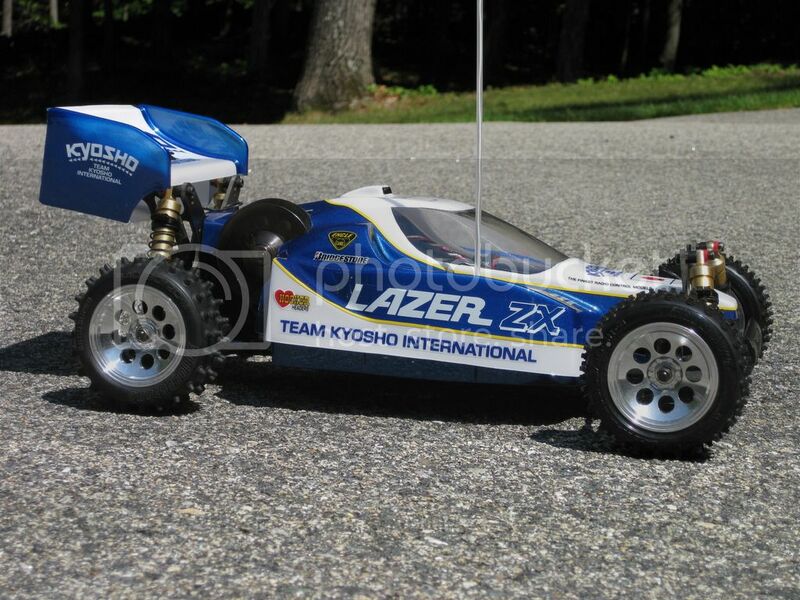 I bought the reproduction body on eBay from Team Bluegroove. Jonathan's bodies are nice to work with, though the finer details are less pronounced than the original in most cases. I'm not a purist, so I don't care to spend $$$ for an original body. I bought the reproduction decals from marwanrc.com. Marwan is a great guy who also frequents this forum and answers questions from time to time. I've found that dipping decals in soapy water (a few drops of dishwashing/fairy liquid in a bowl of warm water) before application to the body allows you to position it perfectly before it sticks or peel it off again, dip again and retry the application until it's perfect and then press/squeegee out the water to make it stick. Use a hairdryer on warm/hot on curved decals that don't want to stick well. Use a wet toothpick + hair dryer to press decals into tight corners/crevices. Many thanks, I tried marwanrc and they had none so managed to find them with MCIRacing and they are being sent over. Soapy water is a great trick, I will definitely try that along with the hair dryer. I'm working on a re-re Boomerang at the moment (always wanted one) until I get the decals for the ZX. As you can see I have a long way to go, but this is my original car so will just take my time and bring it back to life, it's never going to be mint but brings back many fond memories. Do you know where I can find the manual online for the buggy, I have lost it and would love to have it to work from. Cheers. It's not a convenient PDF, but seems complete. 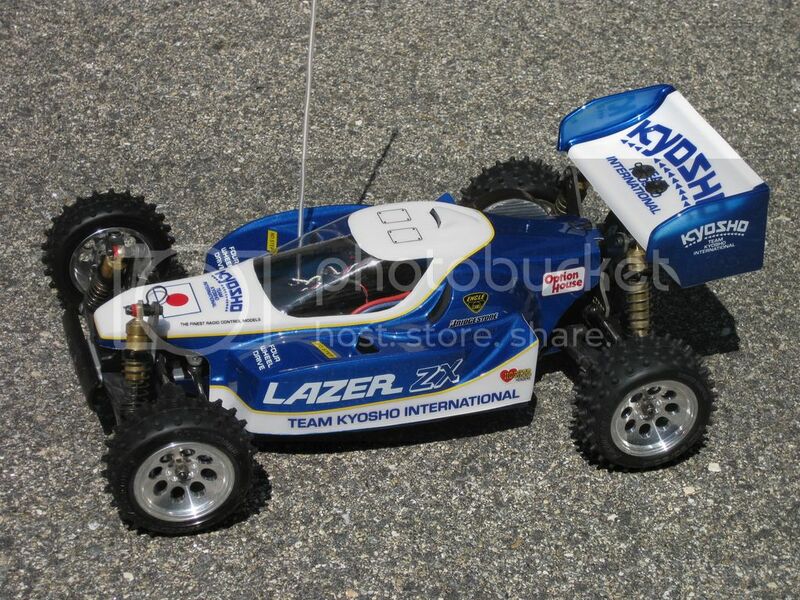 Kyosho Lazer ZX manual converted to PDF attached. I've just done a deal for one of these. 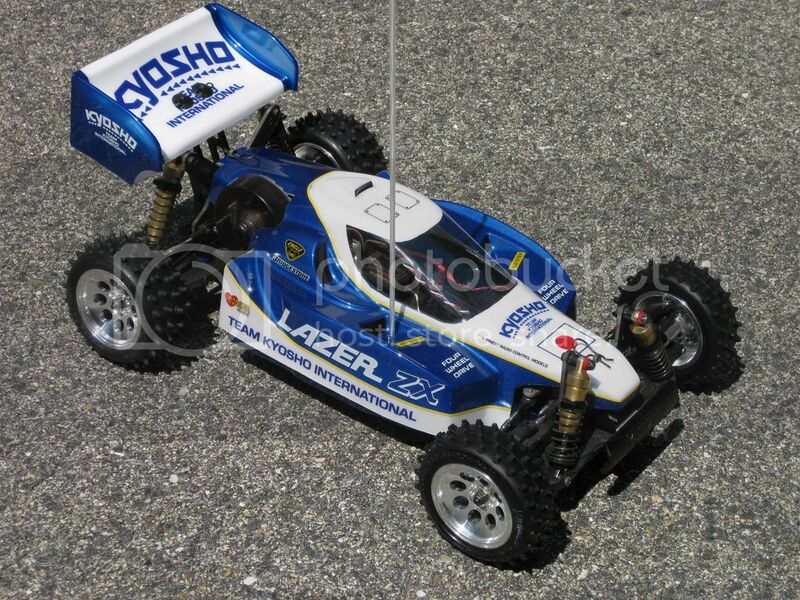 They're the only Kyosho model that I've ever had an interest in. No doubt I'll have lots of questions once it arrives.